First off, let’s get one thing straight. The Low Countries are aptly named. They’re low. No mountains at all. None! This trait is such a central aspect of that region of northern Europe that Jan Dibbets, a Dutch conceptualist, made a satirical photo collage in 1971 entitled Dutch Mountain. 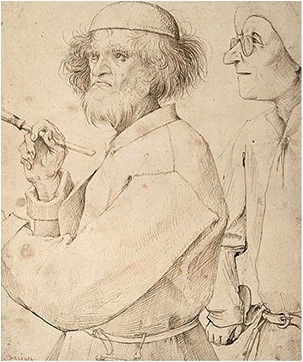 Dibbets invented an elevated terrain for his flat homeland and so did Bruegel, four and a half centuries earlier. That said…. In the 1560’s Pieter Bruegel the Elder (1524-1569) was commissioned by a wealthy Antwerp banker and art collector (the art world has changed little!) to produce a series of paintings chronicling the seasons of the year. For many years it was thought that this group consisted of portrayals of all twelve months, however it is now generally accepted that Bruegel in fact made six paintings, each canvas representing two months. Five are extant; our own gem, The Harvesters (aka The Corn Harvest) in the Met; The Haymakers in the National Museum in Prague; and three in the Kunsthistorisches Museum in Vienna, Hunters in the Snow, The Gloomy Day and Return of the Herd. As the Brits say, “one’s gone missing”. (Note to self: buy an old house in the EU and check the attic.) In fact the English playwright and novelist, Michael Frayne, wrote a marvelous book, Headlong, in which that is exactly what happens, albeit in the midst of misadventures and mid-life crises. The paintings in this cycle are acknowledged masterpieces when considered both as a series and individually. But, like all art, they exist in a continuum of images and ideas that predate their making. These pictures are considered by many to be among the first pure landscape paintings in history, even though figures appear plentifully in each. More than a century before Bruegel, the Sienese master Sassetta, created the tiny landscape painting, Un Castello in Riva ad un Lago. (This is, by the way, a recent re-attribution from Lorenzetti to Sassetta.) What painter doesn’t love this charming and heralded painting? While this panel is arguably one of the earliest landscape paintings known, the real full-blown precedent for Bruegel’s ‘take’ on landscape is the low country painter Joachim Patinir who died roughly contemporaneously with Bruegel’s birth. 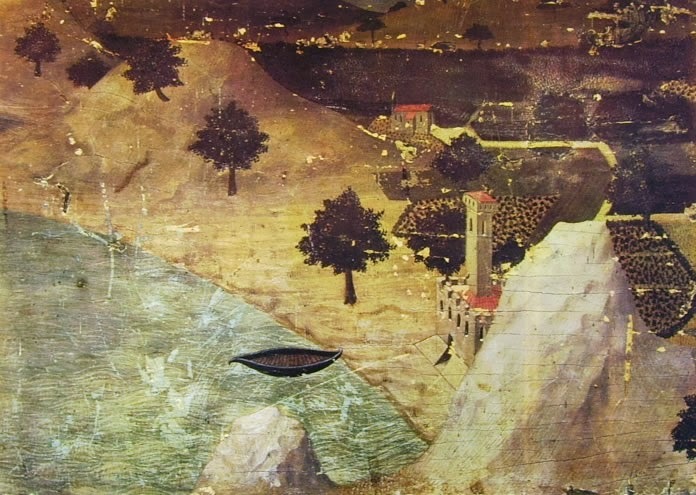 In this very typical Patinir, Landscape with St. Jerome (1524), all the landscape elements are in place. 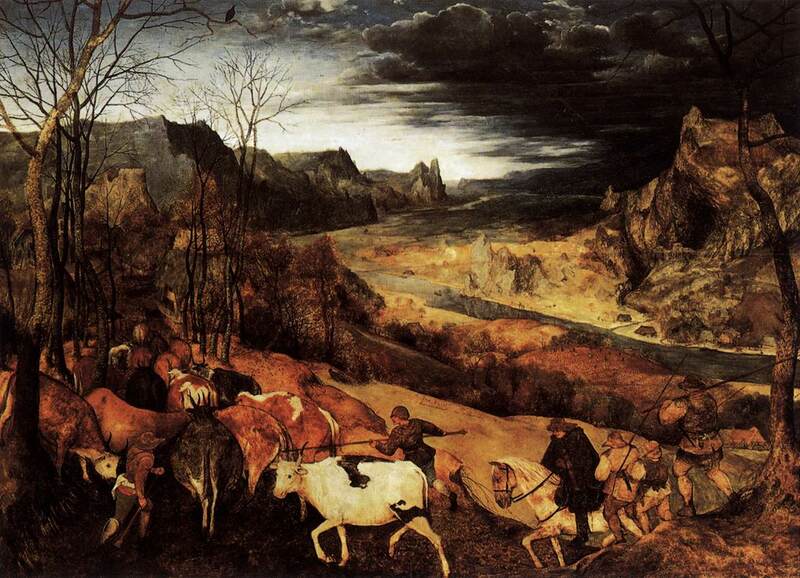 However, unlike Bruegel, Patinir tells a story that is quite removed from the setting. 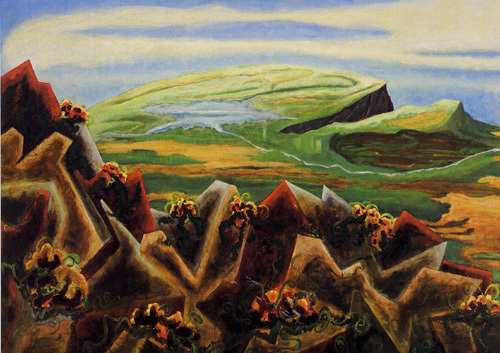 In keeping with previous tradition, the landscape serves mainly as a frame for the narrative. We see the biblical tale, set within a cave, played out against a sweeping landscape. Patinir’s narrative is not part of the landscape nor is it dependent upon the landscape, but simply sits in the landscape. In his Seasons cycle, Bruegel lifts much from Patinir structurally and stylistically, but he does something radical and distinct from his predecessor by animating his figures only according to the reality of the seasonal condition in which they appear. The characters in these paintings are in many respects, simply cogs in Bruegel’s stunning choreography of land, light, space and weather. It should also be noted that this cycle has little in common with the artist’s many earlier portrayals of human folly, whether in the Tower of Babel, Icarus or the Prado’s frightening work, The Triumph of Death. In fact, the Seasons really don’t contain any such narratives, allegorical lessons or cautionary tales. In The Gloomy Day, with its bone-chilling atmosphere the foreground feels and looks precisely like February. Four burly guys are pollarding trees because such pruning is best done before the new growth of spring. The season rules. In the Return of the Herd, it rules again as the animals are brought in for the winter. So it goes through each of these pictures, The Harvesters, Haymaking and Hunters in the Snow. Humans here are portrayed as a part of what we call ‘nature’. No higher order, no countries, no mythology and no religion. John Lennon would approve. Here Bruegel is nothing short of enlightened. Humans are fully integrated in their surroundings. These are democratic pictures—harmonious images of simple folk taking care of the things they must, all the while fully embedded in the land, light and weather of their universe. So what about those seasons? What about the portrayal of two months in one painting? Each of these paintings has an identical structure: A foreground holding most of the figural and behavioral elements, a partial mid-ground, and a broad deep space leading to a horizon and, of course, sky. And that sky, in each work, holds a particular light—the coming light. In some, it is the light of opening and in others it is the light of closing. The herd returns in October and we see in the distance the cool light of November. The trees are pollarded in damp dark February but we see a hint of March with its portent of the warmth of spring glimmering in the distant sky. The earth is turning and we are drawn towards that turning. But that turning holds no real promise– only change. We move and are moved with palpable sobriety into the next cycle, where we start again. It’s real and somewhat sad but, in its repetition, perhaps reassuring. Its simply the way things work. 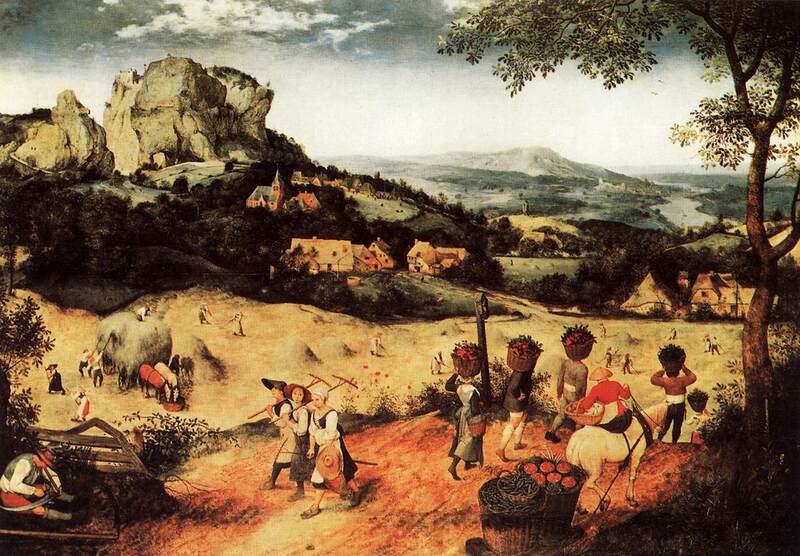 It is useful to contrast these paintings of Bruegel with other more recent landscape work. The paintings of the prolific Hudson River School come to mind. The way artists in that School used light is fully in opposition to Bruegel’s approach. The mountains are majestic and they frame the sky. It is a sky of promise and destiny—a destiny great and deserved. The wagons move towards the light—towards the white man’s god—and towards ever more plentiful land. In her landmark book, Nature and Culture, Barbara Novak writes of the operatic scale of these paintings and Simon Shama, in Landscape and Memory characterizes the Nineteenth Century view of the American landscape as the real American church—the true religion of America. These wonderful and bombastic paintings were soon supplanted by the smaller, largely uninhabited, luminist paintings suffused with the even handed pantheistic light of Emersonian thinking. The light in those paintings and the internal peace they promote have none of the grit, daily rhythm and reality of Bruegel. Yet, as distinct as they are in character, in both the Hudson River and Luminist schools, the landscape carries an agenda for how we are to think about our lives, our God and our destiny. Not so Bruegel. Now on to those mountains! Pretty weird actually (even weirder in Patinir), in their pointy unsteady formations aiming skyward—clearly dangerous and inhospitable. Where did they come from? We do know that Bruegel traveled to Rome from Antwerp and back. The trip was made, according to legend, mostly on foot. He made drawings throughout the trip, many portraying the Alps. 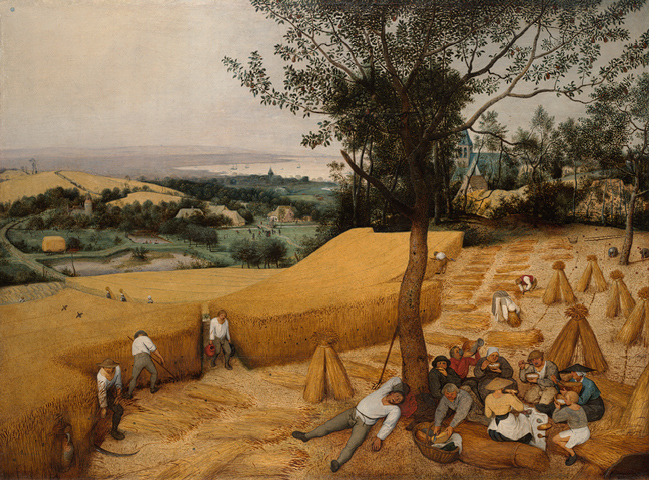 In the Seasons, and in various earlier paintings, Bruegel regularly uses a process akin to Photoshop. He collages those mountains (and funky versions of those mountains to boot) liberally and imaginatively into the native low country landscape to create five great fictions. As the saying goes, ‘the best landscape paintings are finished in the studio’. Think how boring these paintings would be if they were flat pancakes of land arriving at flat horizon. No foreground is to be found, only a rush to the inevitable horizon. Later painters like Philips Koninick (1619-1688) did find the secret to creating compelling paintings of flat land by privileging the often unstable and dramatic northern skies over those broad flat expanses. I have no room here to mention all the pockets of funny details in these paintings. The boats in The Gloomy Day careening around and crashing in the roiling merciless river; the dude perched in the tree on the far right rear of The Harvesters and in that same painting the sleeping guy—splayed and passed out from too much grog and sun in a sleepy mid-summer afternoon; and finally in Hunters in the Snow, the weird centered crow, (pointed out to me years ago by the painter Gary Stephan) suspended and flattened at an unnatural angle doing its duty to the composition as a sort of avian punctuation. There is so much more to say about the particulars in each painting but that is for another time. In 2004 and 2005, I set out on a project to produce large scale, semi-abstract “riffs” on these paintings. No figures appear. Foreground to deep space—August into September, October into November and so on. Then I had the problem of the Bruegel that’s gone missing. It is fairly clear the lost painting was the spring painting—April into May. Below is my take on that painting. Postscript: From 1300-1850 there were periods of extreme cold, particularly in the northern hemisphere, commonly referred to as the ‘Little Ice Age”. Controversy surrounds the actual extent of those cold spells but interestingly enough one of those periods begins in 1550-60. 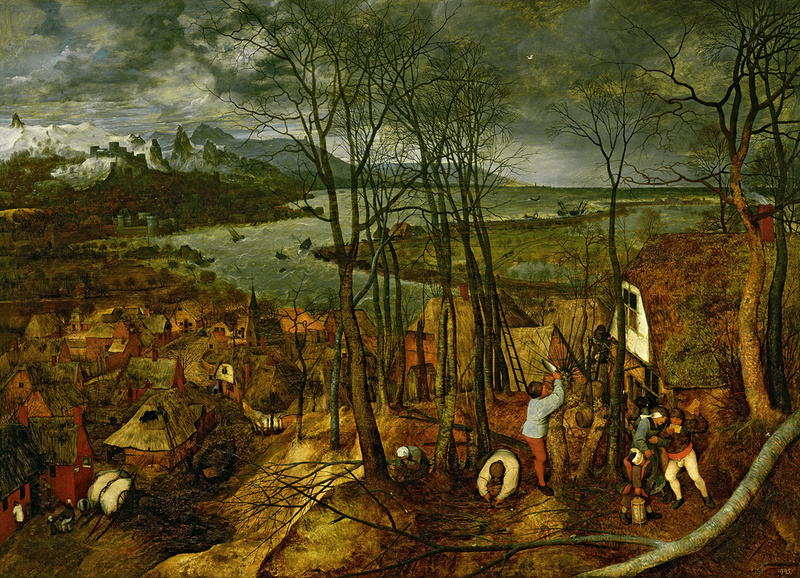 Precisely the time of Bruegel’s work on the Seasons. 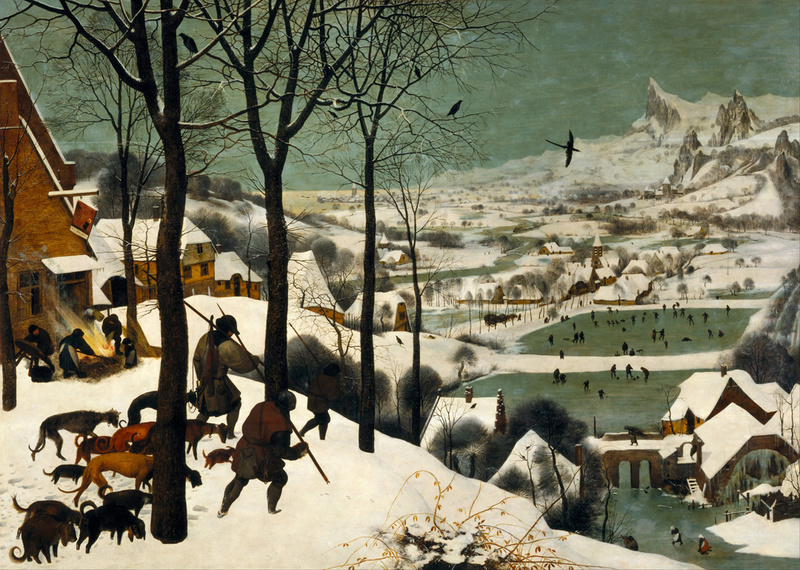 On the Wiki page for the “Little Ice Age”, Hunters in the Snow is the featured painting. Art evidences science! Love all those paintings! And that’s a particularly brilliant Amenoff! Great piece altogether!